Although this is an old English name in its own right, it is a dialectal derivative form of the pre medieval (11th Century) "Hausard", a metonymic or job description of a maker of daggers and swords. The name derives from the French "hansart", itself comprised of the Germanic elements "hant" meaning hand, and "sach", a knife. Although "Hansards" have been landowners in the Surrey-Sussex region since the 12th Century, the name and its variants has its greatest popularity in East Anglia, and specifically Norwich. This was the home of Luke Hansard (1752 - 1828), who founded the Parliamentary Record, which still bears his name. 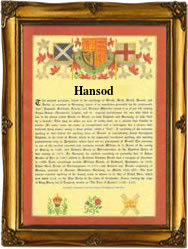 The variant form, as Hansed or Hansod, is much more rare. Examples of the spelling include; William Hansed, who married Amy Johnson at Parson Drove, Isle of Ely, in 1791, Mary Ann Hansed, who married James Preston at Kings Lynn, Norfolk, on November 27th 1843, and Reginald William Hansed, born at Wisbech, Cambridge, on April 29th 1900, in the reign of Queen Victoria (1837 - 1901). The first recorded spelling of the family name is shown to be that of John Hansod, which was dated October 1st 1726, a christening witness at St. Clement's Church, Norwich, during the reign of King George 1, known as "Hanover George", 1715 - 1727. Surnames became necessary when governments introduced personal taxation. In England this was known as Poll Tax. Throughout the centuries, surnames in every country have continued to "develop" often leading to astonishing variants of the original spelling.